New Jersey food producers are able to compete on a national level despite the state’s small geographical area thanks to lean manufacturing processes and help from a support system geared specifically to food production. 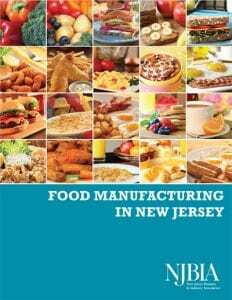 That’s according to a new report released today by the New Jersey Business & Industry Association (NJBIA) called Food Manufacturing in New Jersey. In all, New Jersey has 937 establishments that employ more than 30,000 paid workers representing a payroll of $1.3 billion, the report finds. The biggest food manufacturing county is Bergen, which has 137 establishments employing just shy of 5,000 workers. Bergen is followed by Passaic, Essex, Hudson and Middlesex counties. In all, New Jersey ranks eighth in the number of establishments and 20th in employment compared to the rest of the states. The seven states that have more establishments, however, are vastly larger geographically and, except for one, have a significantly higher population. “When it comes to food manufacturing, New Jersey punches above its weight,” Siekerka said. The report cited the role played by the Food Innovation Center at Rutgers University to assist food companies in training, education, product and process development, and more since the early 2000s.